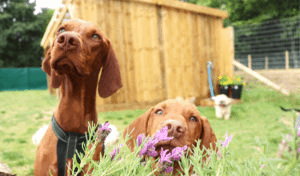 Located in Cornish countryside Doggy Day Care Cornwall, offers an alternative to dog boarding, sitting and kennels. It has two large fully secure fenced gardens with an orchard to provide plenty of shade, as well as two heated indoor areas packed full with luxury dog beds and toy, with daily activities to test your dogs inquisitive nature, and to stimulate their senses, including treat hunts, sandpits and paddling pools to agility and fetch! All enjoyed under the constant supervision of Jordan and his team. Doggy Day Care Cornwall was started to offer a style of care that we might be more familiar with when taking our children to a nursery or play school, as opposed to kennels or a caged environment that our home companions just aren’t used to, after all, they are part of the family. We offer a range of services, including: secure dog home boarding, dog sitting, dog socialisation, dog day care for commuters, holiday makers, or for customers in need of a helping hand. Jordan and his team are all experienced dog handlers, and are used to dealing with family pets with a range of characteristics.